Buy live Zebra Obliquidens Cichlids from a trusted breeder. All orders shipped to your door with a live arrival guarantee. Any fish that are DOA can be replaced or refunded. The Astatotilapia latifasciata or Zebra Obliquidens is a popular cichlid, which is native to the waters of Lake Kyoga and Lake Nawampasa, which are two of the smaller lakes just north of Lake Victoria in Uganda. 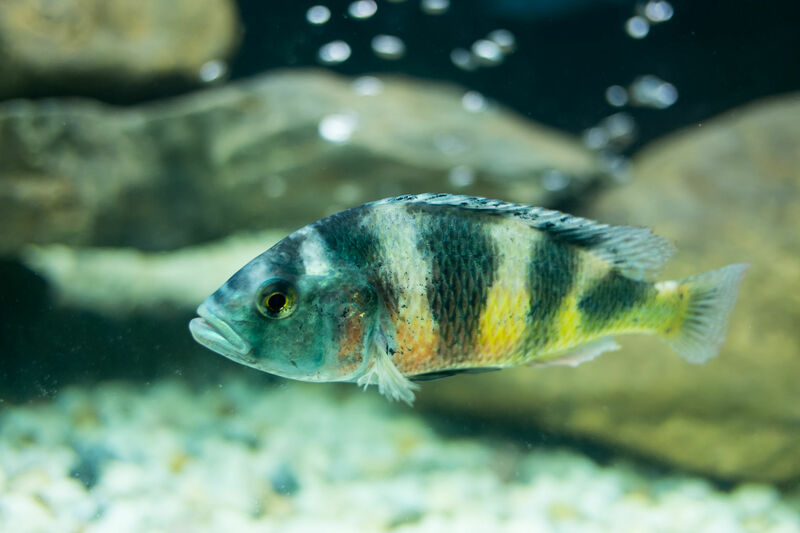 This beautiful Victorian cichlid displays a light gray with black vertical striping pattern, along with a yellow patch on the lower half of their body, which goes from about midway, down to their tail. Males will also develop a red patch over their gills, which blends into the yellow. Males can get to be about 5" in length and females will be a little smaller. Zebra Obliquidens are very popular because they are very mild mannered for African cichlids. They are typically non-aggressive accept sometimes a dominant male may show increased aggression levels towards other males. They will also show increased levels of aggression when there isn’t an adequate amount of caves and passageways for claiming territories, or when breeding. Compatible cichlid species are other mild mannered Victorian cichlids like the Ruby Green cichlid, Lake Malawi peacocks like the Sunshine Peacock, and smaller, mild mannered Haplochromines like the White Blaze Chrysonotus. Zebra Obliquidens are native to the moderately hard waters of Lake Kyoga and Lake Nawampasa in Africa. It is best to try to provide similar neutral to hard water conditions in an aquarium, for these fish to show their best colors. The water temperature should be between 74 - 78°F with a pH between 7.2 - 8.6. Additives like Cichlid Lake Salt and Malawi/Victoria Buffer will condition the aquarium water for African cichlids. The aquarium substrate should be sand or fine gravel, and it should be decorated with plenty of rocks and caves for the fish to claim territories or seek protection. In the wild, Astatotilapia latifasciata are insectivores, but in an aquarium they can be fed a wide variety of foods that are high in protein. Plankton based flakes mixed with commercially prepared cichlid pellets and mosquito larvae, brine shrimp, cyclops, and or daphnia will give them a well-mixed diet. Such foods will help bring out the bright red and yellow colors in these fish. Check out this video of a pair of Zebra Obliquidens preparing to spawn on a rock. Zebra Obliquidens are sexually dimorphic. Only males develop the bright red patch over the gills. Males will also grow to be slightly larger than females. Zebra Obliquidens are prolific mouthbrooders that will easily breed in an aquarium with plenty of space and a flat surface for spawning. While spawning, the female will pick up and hold the eggs in her mouth to protect them. Females may continue to carry the eggs and fry in their mouth for up to two months. It is a good idea to keep several females with one male when breeding. This will help spread out any aggression displayed by the male.